In addition to being scientists, world travelers, philanthropists in very limited senses, and generally awesome, Meaghan and Amy are also paleoartists. 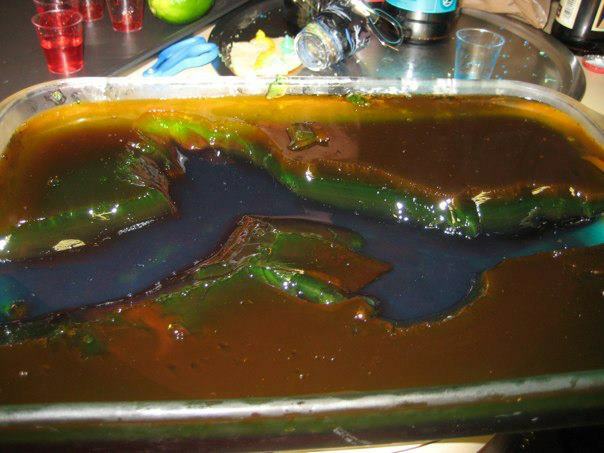 Here are some recent works of brilliance, cast in alcoholic jello. The GRAND CANYON of jello shots. No literally, this is the grand canyon carved out of 6 layers of booze-ridden jello stratigraphy, overlaid by a final, nearly-toxic river of vodka and blueberry jello. You're welcome, everyone. You're welcome.